"I like it! Hardly a fail probably just not exactly what the brief/client requested/required. "Explain why you think its a failure. Right now it looks like a portrait and I don't see a problem?" "It was actually all my decision, I simply didn't do enough exploration through thumbnails. What you are seeing here is just a small portion of the image. Matt what you are saying is exactly the problem, it looks like a zombie portrait which is not what was right for the narrative/scene. What I had in mind was a bit moodier, which I thing I achieved in the second sketch. Tell me if you agree." That sketch looks awesome. I can see why you changed it now. But I feel that the zombie should maybe looking more forward or more down at the victim. 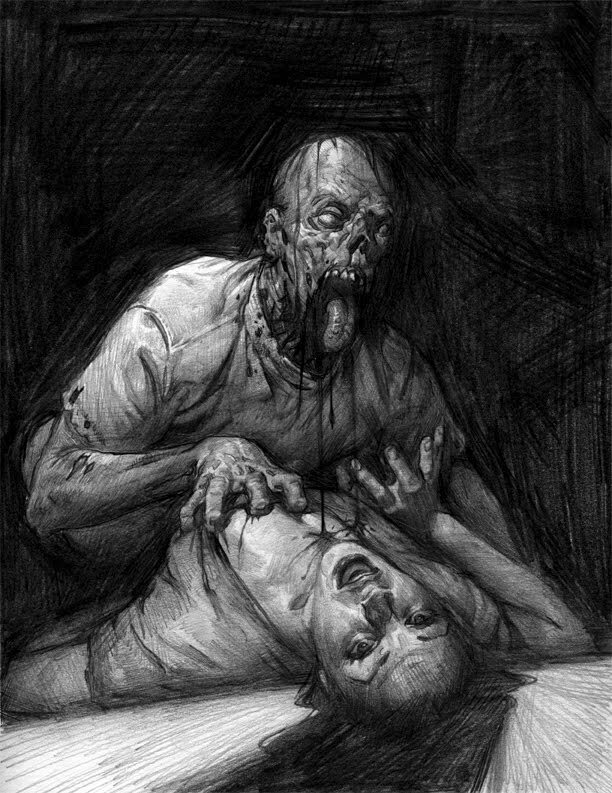 To me it kind of feels like he is just crawling over a person, not like a zombie who is hungry for brains, or in this case boobies! I like that the second has the viewer identifying with the victim staring out... instead of the zombie. The zombie looking out or down, I think, would be more menacing... I agree with the above comment. He is kind of looking out isn't he? I didn't notice due to the dead eye... at first glance.